C5-6 quadriplegic kayaking with reinforced seat, outriggers, side supports and ActiveHands gloves. Kayaking is one of those sports you either are totally on board with, or aren’t too sure about. If you’re in the not-too-sure boat, you should know it’s extremely adaptable. Many people with spinal cord injuries, mainly paraplegics but even some quadriplegics, are equal to their able-bodied kayaking counterparts when it comes to their kayaking abilities. This is not possible with most other adaptive sports, so it’s no wonder kayaking is on the rise among people with disabilities. Kayaking has been around for thousands of years, created by the Inuit in Canada who designed the original kayak as a hunting boat. And you can tell by its design, small size and agility level, that it’s quite adept for hunting. But fast forward to 2017, and kayaking has become an especially popular leisure activity amongst people with disabilities. And the good news? Adaptive kayaking is available at hundreds of locations around the country. Even if you don’t live near an adaptive kayaking organization, it is possible to adapt your own kayak at home and get on the water with family and friends. Paddle on! Most kayaks can work for people with SCI, but for the most stability, pick a rigid one. Inflatable kayaks are popular because they are not as expensive, but they also aren’t as stable. You’ll also want a kayak that is lightweight and has a relatively shallow cockpit to make transferring easier. Depending on your location, a variety of transfer systems are used to get into a kayak. Some quadriplegics use a Hoyer system on a dock and others even use the lifting system on their truck to get into their kayak. If you don’t have either, having the assistance of two able-bodied people is usually enough to get a quadriplegic in and out of the kayak safely. 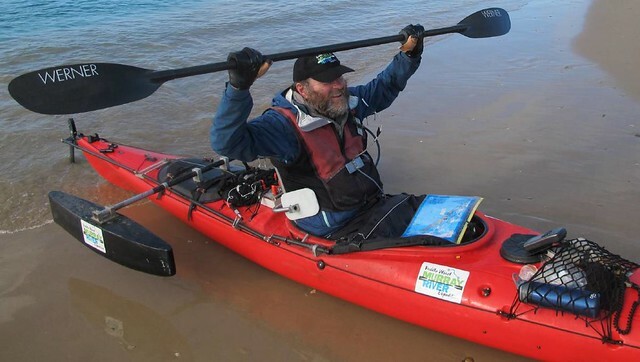 Since kayaks are narrow, some paraplegics require assistance getting into a kayak. The best way to do it is to get into the kayak on dry land, whether on a dock or beach, and then put it in the water. Before you start paddling, protect your skin! This is important for both paraplegics and quadriplegics, but even more so for paraplegics since they tend to be more active in the water. At a minimum, put your wheelchair seat cushion underneath your bum when sitting in your kayak, and place a rolled towel between your legs, or even behind your back, to create support. Some go an extra step and line foam inside the kayak where their bodies will be touching, especially on the edging of the kayak for transfers, and the foot pad and heel pad area in the front of the kayak where your feet will be sitting for long periods of time. It’s important to cushion every point of contact. Quadriplegics with limited arm movement need a few additional pieces of equipment to kayak. First, a kayak seat is necessary since most quadriplegics have limited torso movement. While special seats are made just for quadriplegics that can be inserted into kayaks, a cheaper solution is to purchase an outdoor folding chair with a metal back. Watch how one quadriplegic accomplished this here. A quadriplegic with some arm movement but limited hand movement will also need a way to hold a paddle. ActiveHands, the popular gripping gloves made for quadriplegics for all types of sports, work great for kayaking. If you don’t want to spend the money, you can also duct tape or Velcro the paddle to your hands. Some quadriplegics also permanently affix their paddle to their kayak so they don’t have to worry about holding it. There are many ways to do this. See below for links. And lastly, to prevent your kayak from tipping over (kayaks are notorious for this), you can outfit your boat with outriggers and pontoons, making it impossible for the kayak to turn over. Long metal arms with a pontoon on the end of each are placed on each side of the kayak, creating a 100 percent tip-free experience. * Sip ‘n Puff capabilities are also possible to integrate into a kayak so that quadriplegics with no arm movement can enjoy the sport, too. We hope you are excited to try adaptive kayaking! Even if you can’t swim, with a properly-fitted life jacket and all of the necessary equipment, you can enjoy this awesome sport like everyone else on this planet, and that’s a beautiful thing. Have you tried adaptive kayaking? This entry was posted in Feature stories and tagged adapted kayaking, adaptive kayaking, adaptive sports, Spinal cord injury, wheelchair kayaking on July 13, 2017 by Tiffiny.